It just wouldn’t be autumn without these Dark Chocolate Chip Pumpkin Muffins. They make the perfect “grab n go” breakfast and if you are looking for a healthy, great-tasting pumpkin muffin, this is the one for you! There are so many reasons I love to make muffins, the least of which is how easy the recipe comes together. You will recall that from my Moist and Easy Banana Muffins, I describe the process of using two bowls and a mixing spoon, making clean-up time super easy and quick. Another reason I love muffins is the endless possibilities of using different types of add-ins. 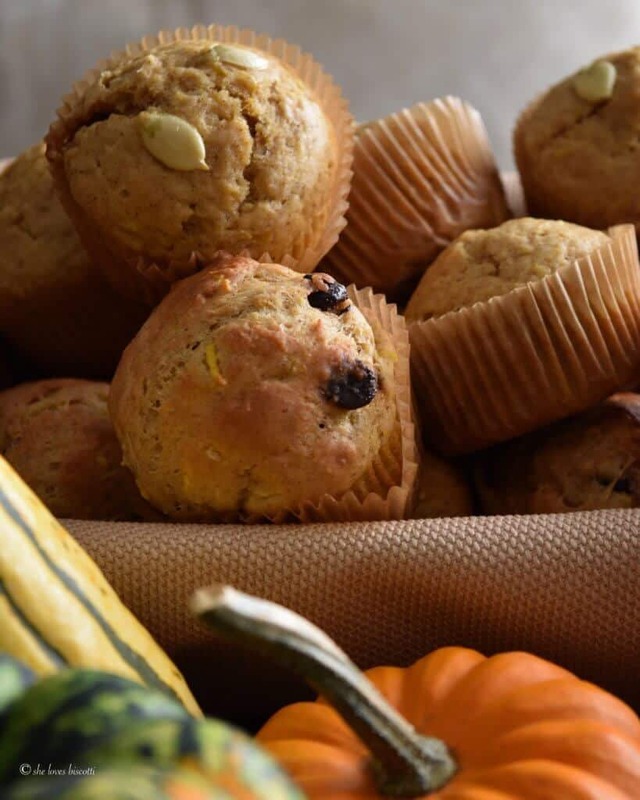 For example, with these Dark Chocolate Chip Pumpkin Muffins, you can easily add different nuts, raisins, cranberries or even shredded or diced fruit. At this time of the year, there really is no shortage of pumpkin recipes , sweet or savory or spiced. 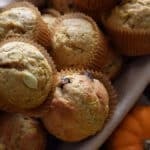 This particular muffin recipe from allrecipes.com caught my eye many, many years ago. As you may have guessed, I have adopted it as my go-to pumpkin recipe for the fall. Here are some of the changes I made in order to make this muffin a healthier choice for family and friends. Replace the vegetable oil with applesauce. Along with such a wonderful abundance of pumpkins in the fall, there are so many types of apples that can be found at farmer’s markets. If you are interested, come and take a look at how easy it is to make your own chunky applesauce. While I am roasting my pumpkin, I will usually add a few apples that I will later mash up and incorporate in the batter. So, by replacing the oil with applesauce, we have made this recipe a little heart healthier …I assure you that your heart ♥ will thank you. 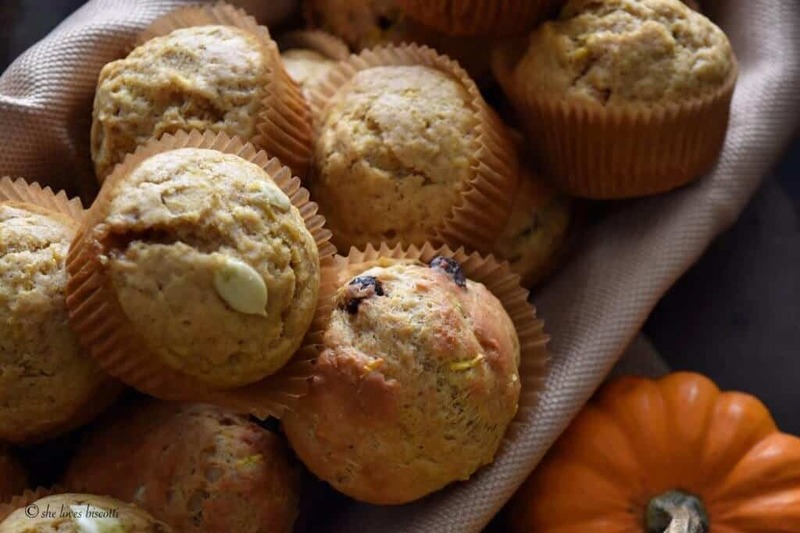 Replace some of the all purpose flour with whole wheat flour: A few months ago, I shared how easy it is to make any muffin recipe healthier (at the time I was sharing a recipe for healthy zucchini muffins). I can already hear the question…why would you want to replace a refined all purpose flour with a whole wheat flour? Well, most of you probably know that fiber is important for regularity. Studies have also shown that it can also prevent heart disease and diabetes. Once again, it truly is a little change that is barely noticable taste-wise, but your heart ♥ will once again be grateful. Reduce the total amount of sugar: Have you ever wondered how much sugar you are actually consuming when you make a simple muffin recipe? Let’s do the math…just for fun. Let’s say that a muffin recipe calls for 1 cup of sugar. Divide that 1 cup by 12 -since we are making 12 muffins. The end result is about 4 teaspoons of sugar per muffin. If this were a piece of cake, or a cupcake, I wouldn’t blink an eye… but we are talking about a muffin, which in my book, should be healthy. Replace semi-sweet chocolate with dark chocolate: Once again, studies have indicated that dark chocolate is a great source of antioxidants and guess what? Yup, it has been shown to reduce the risk of heart disease. But this doesn’t mean you can empty a whole bag of these dark chocolate chips in your muffin batter. A little goes a long way! If you are a muffin lover (like I am) I would encourage you to look at your favorite muffin recipe with a critical eye and see what changes you can make to render it a little healthier while still tasting great for your family and friends. 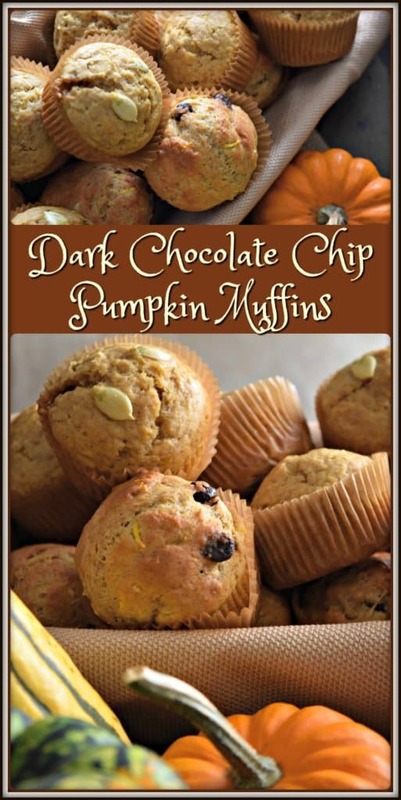 Hope you get a chance to try these Dark Chocolate Chip Pumpkin Muffins. Who knows, they just might become your go-to healthy pumpkin muffin. 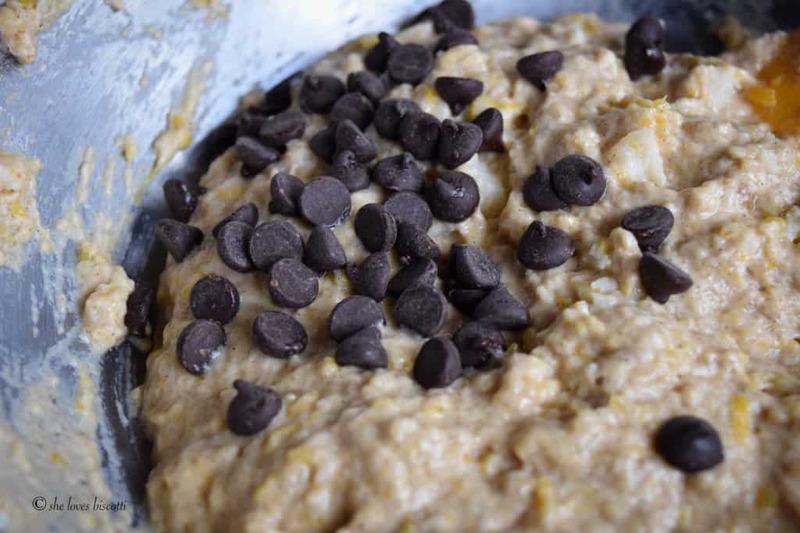 These Dark Chocolate Chip Pumpkin Muffins make the perfect "grab n go" breakfast. If you're looking for a healthy, great-tasting muffin, this is the one! Paper line 12 muffin cups. I will also spray my liners with a non-stick spray as I find these muffins get stuck to the paper liner. In a separate bowl, whisk together egg, buttermilk, pumpkin puree, applesauce and vanilla extract. Add liquid mixture all at once to the dry ingredients. Stir just until moistened (mixture will be thick). Bake for 20-23 minutes or until top bounces back when lightly touched. Roasted pumpkin puree can be replaced by canned pumpkin puree. 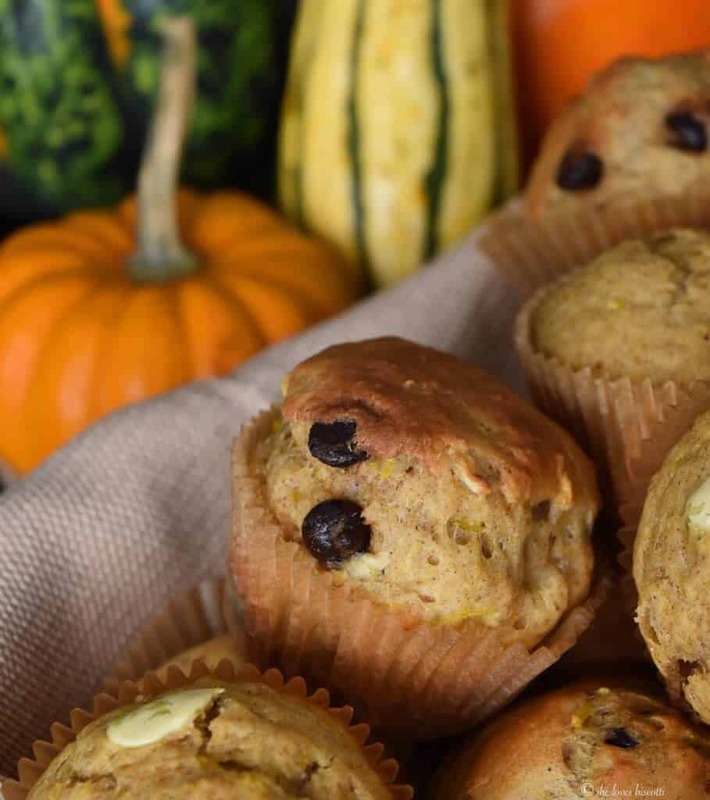 DO YOU LOVE THIS PUMPKIN MUFFIN RECIPE? Hey Mary just what I was looking for we roast a sugar pumpkin and really want to try it thank you so much!!! Thanks for sharing this wonderful recipe. I hadn’t thought of using the ‘base’ muffins for different kinds of add ins until you mentioned it. That’s a terrific idea. And turns one recipe into a lot. A terrific recipe for fall and your suggestions for substitutions are just wonderful.